This is a charming novel that was divided into two volumes – presumably by the publisher – but if you just read Shadowbridge you’ll be disappointed at the end, since it’s not a whole story. Fortunately I enjoyed the first half enough to be happy to head right into the second half. That’s a little unusual since I’m not generally a fan of fantasy, but it has elements reminiscent of both Tim Powers and Michael Swanwick, whose works I enjoy. Shadowbridge is a world of a few small islands and a great many giant bridge spans across its ocean. Thousands of people live on the spans of the bridges, and their origins are lost to antiquity. Their medieval cultures are mixed with fantastic creatures living alongside the humans, demigods walking the world, and the gods dabbling in mortal affairs, especially through the Dragon Bowls on each span through which favors are visited on a few worthies. Into this world strides Bardsham, the greatest storyteller of his age, through the use of shadow puppets. But that was years ago, and the story opens with his daughter, Leodora, taking up his legacy, with his puppets, and aided by his former assistant, Soter, a drunkard who helps her set up engagements. Leodora performs under the name of Jax to hide her gender, and gathers stories from the spans she visits. In time they’re joined by Diverus, a gifted musician who has been touched by the gods. But Soter is terrified that the horrible fate that was visited on Bardsham and his wife Leandra – Leodora’s parents – will find and doom her as well. 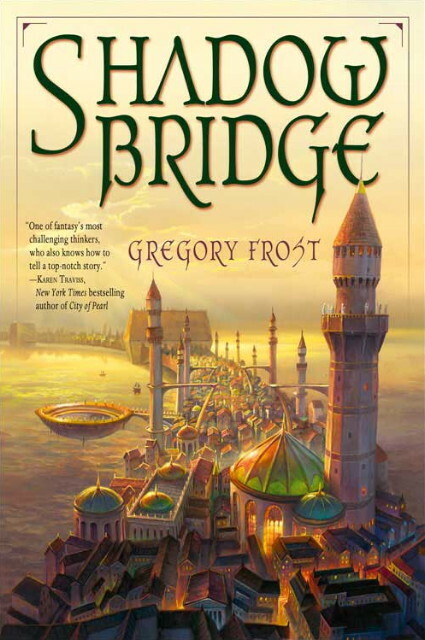 Shadowbridge has a touch of metatextual feeling to it, with regular asides in which a character tells a traditional story from somewhere on the bridge. Each of these stories is itself a rewarding vignette on its own, and it gradually develops that the stories have grains of truth as well as elements that have evolved over the centuries; which pieces are which is left up to the reader, and they give the reader something to mull over while reading the rest of the novel. The story takes a little while to get going, spending a large chunk of the first volume on Leodora’s childhood, and the tragedies which led her to leave the island on which she grew up to follow in her father’s footsteps. It goes on a little too long for my tastes, though there’s some good stuff in there, especially her earliest years. And then another chunk of time on Diverus’ story, which is more exotic and ominous. But once the backstory is out of the way, things move along quickly, as Soter takes them further and further from Leodora’s childhood home and ultimately back to the span where the key events in Bardsham’s downfall occurred. The second volume takes place mainly on this ancient span, as Leodora learns how Bardsham was seen by those living there, and also glimpses a mysterious span-beneath-the-span which she suspects has some role to play in the story. This is some of the best stuff in the novel, especially the city below, which has several layers the characters have to peel back. The general setting of Shadowbridge is not quite as exotic as I’d hoped – often it’s just a slightly quirky medieval world – but some of the specific ideas are quite well realized. 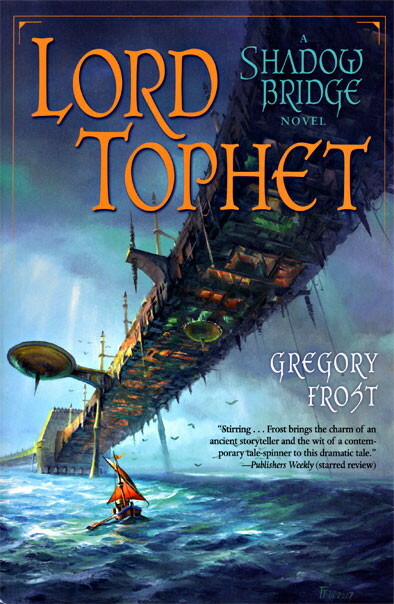 Frost has an accessible writing style with which he weaves some evocative tales. As far as the two authors whose work this novel resembles, the setting is more like Swanwick, but the storytelling is more like Powers, albeit not quite so tightly wound around a careful plot. Nonetheless the payoff is satisfying, even if the denouement left me feeling like we don’t really know whether the characters lived happily ever after. All-in-all Shadowbridge is quite an entertaining novel, and if it’s slightly rough around the edges it makes up for that in pure enjoyment and the cleverness of the individual episodes. I don’t know whether Frost plans to write more books in this setting, but I’d read them if he does.